This is the continuation of the journey between Europe and Africa. A flight with Etihad in their business class “Pearl Business” between Abu Dhabi and Johannesburg. The first flight was made in Etihad’s first class “Diamond First” between Paris and Abu Dhabi. 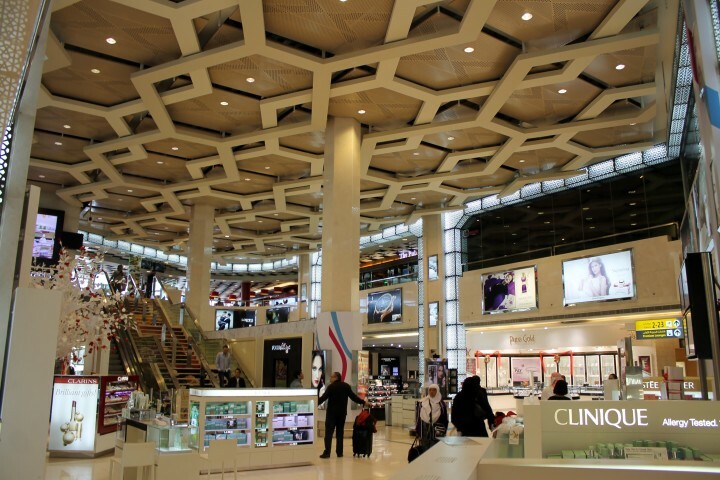 Abu Dhabi has three terminals, two of which are used by Etihad and partners, terminal 1 and terminal 3. Terminal 1 is the old terminal with the green/blue dome like roof that is often seen on pictures while terminal 3 is a much more modern terminal. The two terminals are connected by a long glass corridor, with a walk of a few minutes. My connecting flight was from terminal 3 and therefore it was natural to go directly there. 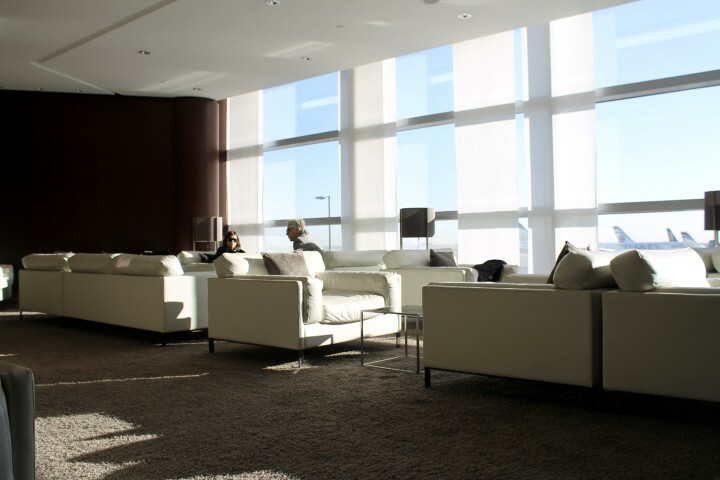 Moreover, it is in terminal 3 that Etihad has its main lounge with a separate first class area. Next to the entrance to the transit hall of terminal 3 was a security checkpoint with a separate fast-track queue for premium passengers and apparently also for passengers with short connections. Later on, however, it turned into one of the usual queues, which is never particularly fun. The whole set-up seemed somewhat messy but otherwise went quickly without problems. The time was just after 7am and the airport was full of life with many departures and arrivals between 6am and 9am. The entrance to Etihad’s lounges is located opposite the security checkpoint with a dark brown entrance. The lounges themselves are located one floor up. 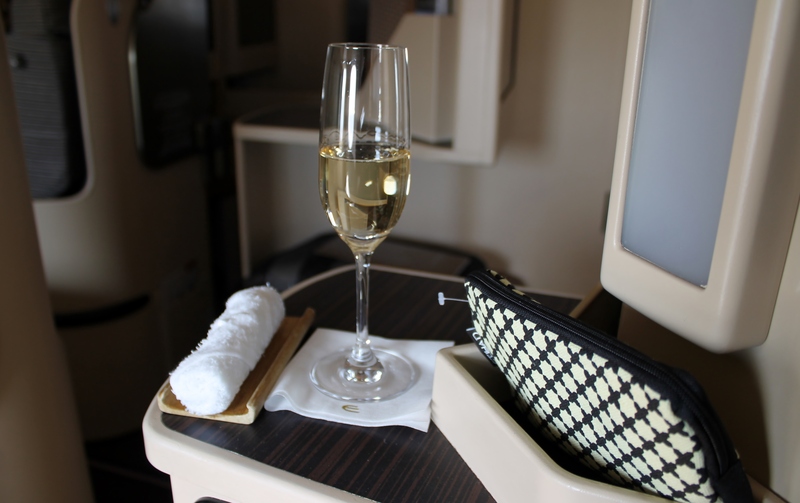 My flight to Johannesburg was certainly in business class but as i had just arrived in first class, I asked about the possibility to visit the first class lounge and was granted entrance without hesitation. The first class lounge was not very large and consisted of a large entrance and hall, an à la carte restaurant to the left, a spa called Six Senses Spa to the right and a large sitting area with comfortable white leather chairs and sofas with a nice view to the apron straight ahead. There was also a business centre and a TV lounge. After a sweaty over-night flight, I started my lounge visit with a shower and then booked a 15 minute free back and neck massage. It was almost three hours to go until departure so there was plenty of time for a massage and time to eat breakfast. The masseur was good and rubbed some new life into my rather tired body. Afterwards was breakfast in the à la carte restaurant where it was possible to order a variety of breakfast dishes from the menu, including traditional English breakfast with pancakes, fresh fruit and Arabic breakfast. There was, of course, the opportunity to order anything in the way of beverages including champagne from a large bar assortment. The service in the restaurant was polite but stressed and even though the food was generally good quality, my visit had more of a fast food feel than the slightly more elegant and relaxed experience I would have rather seen. The last hour was spent in one of the comfortable armchairs in the large salon. Most connecting flights had now departed and there were far fewer people in the lounge. Even in the salon, it was possible to order drinks from the staff who regularly passed through the lounge. Boarding started 45 minutes before departure of one of the gates in the basement. Although terminal 3 opened as recently as 2009, it is already out of gates and for many, a bus will take you out to the aircraft. At the gate, to the left of the podium, was a separate queue for passengers in business class and gold card holders and I was pleasantly surprised when I found out that it also included a separate bus on the other side of the door. While the regular bus was packed to the last square meter, we were not more than a dozen passengers in the premium bus and all were seated. A staircase was used up to the aircraft to door two, which meant a left turn to get to the business cabin. I had seat 7A on board, a window seat on the third row of the business class. First impression of the cabin was quite positive. The cabin felt light and modern with mostly beige colours and details in brown and black. At the front was a wall covered with a painting. As well, it was quite light outside with the sun shining in, which helped to amplify the bright mood. After I stowed away my hand luggage on the shelf above my head, a steward and welcomed me aboard and offered to hang my coat. A short while later he was back again and offered me newspapers and magazines as well as a welcome drink, champagne, orange juice or water. The champagne was Lanson Black Label Brut NV and was served in a tall narrow glass very elegantly. Along with the welcome drink I was given a warm towel on a wooden plate. In front of the seat on the ottoman was a thick blanket in a black case and on top of this there was the menu and drink list. At the side of the seat, in a special storage compartment, there was a toilet bag with a black and white design that matched the decor in the cabin and the pillows and quilt. The pushback was punctual, a few minutes before 11am, followed by a short prayer to Allah and a safety video in English and Arabic. Flight time to Johannesburg was just over eight hours. Etihad has a fleet of Airbus A330s, Airbus A340s and Boeing 777s for long-haul routes as well as a small number of Airbus A319/A320s for shorter routes. 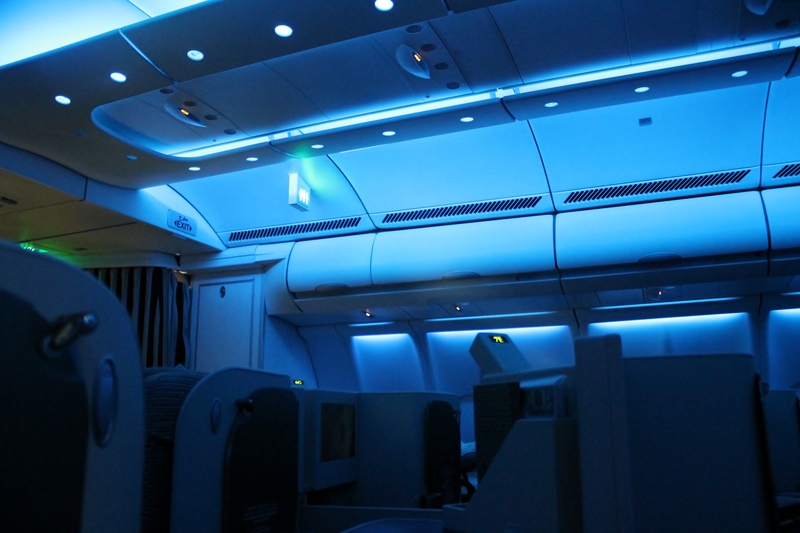 This flight was on an Airbus A330-200 with two classes on board – Coral Economy (Economy Class) and Pearl Business (Business Class). 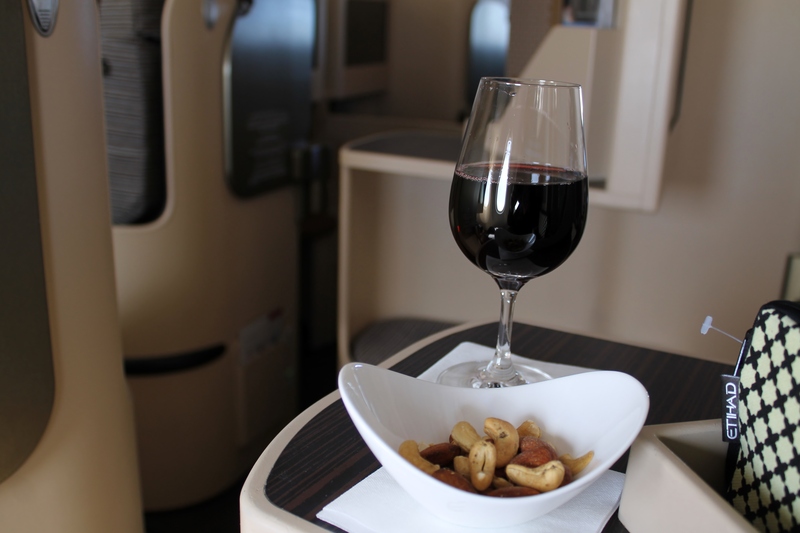 On the Airbus A330, first class (Diamond First) is offered only on 300 models. Business class occupied the front cabin between the first and second door and consisted of five rows (in the middle six rows) with a total of 22 seats. Occupancy in business class on this flight was quite low, around 40 percent, so there was plenty of room in the cabin and many took the opportunity to spread out. Etihad has opted for a 1-2-1 zig-zag configuration (staggered) in business class where all passengers have direct access to the aisle without having to step over any other passenger. The advantage of 1-2-1, which is becoming increasingly popular in the aerospace industry, is that there is a good seat for everyone. If you travel alone you can choose to take advantage of a seat by the window (A / C or H / K) while the seats in the middle (E and F or D and G) work well if you have a travel companion and want to sit together. The seat is beige with a cloth upholstery in black and white that matches much of the rest of the decor. Legroom is very good for business class with 73 inch (185 cm) and when the seat is folded out it becomes fully horizontal. The seat feels spacious without any congestion or feeling of stuffiness. You also get a good amount of privacy in the seat, especially if you sit along the wall in one of the seats directly next to the window (A or K). In front of the seat is an ottoman which can be used as a footrest or storage during the day and during the night, when the seat is folded out, becomes part of the bed. Alongside the ottoman is a food table that unlike most other business stools is not hidden somewhere in seat design but strapped to the wall diagonally in front of the seat with a simple holder. Beside the seat is plenty of storage, a holder for a water bottle, a small reading light, a tray for your toiletries bag and smaller personal effects. There is also a rather large cocktail table that can be used, for example, for glasses and plates during the flight. There is a compartment for newspapers and magazines as well. The seat is controlled by a control panel located on the side of the cocktail table at waist level. It has a number of buttons, both with pre-set seating positions and the option to adjust the seat into the position you want. 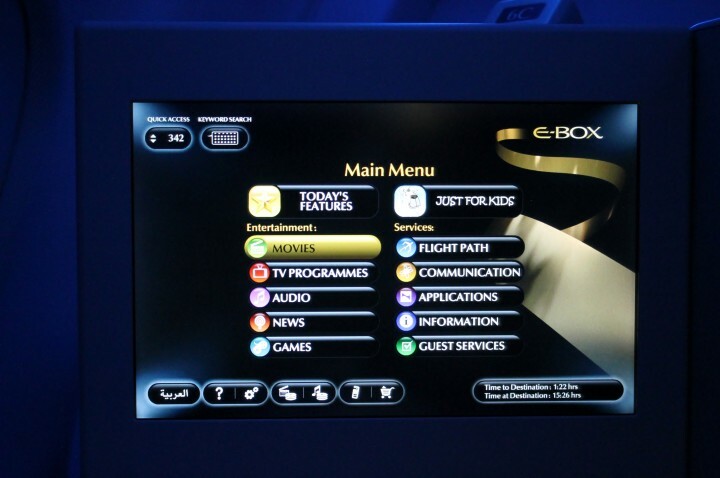 Etihad’s inflight entertainment system is called E-Box and is a very good system with an extensive and quite varied selection of movies, TV shows, music and games. The menu is both stylish and well structured and it was not difficult to navigate through the titles. Each title also has a unique number, e.g. 523. If you find a movie in the entertainment catalog, you can simple enter the number in the system to directly access the movie. The screen is stored in the wall in front of the sea. It folds down by pushing a button and positions itself just in front of the seat above the ottoman. The remote for the entertainment system is available at the side of the seat, under the cocktail table. During the flight, I watched the newly produced documentary about Agnetha Fältskog from ABBA and also had time for some TV series. The menu and drink list was waiting on the ottoman before boarding. The menu was light brown in colour with the text “Contemporary Dining – Inspired Cuisine” and had the drink list tucked in to the middle as a separate sheet. Etihad’s standard approach in business class (and first class) is to provide a decent meal served after take off and to later offer a “Kitchen Anytime” menu. 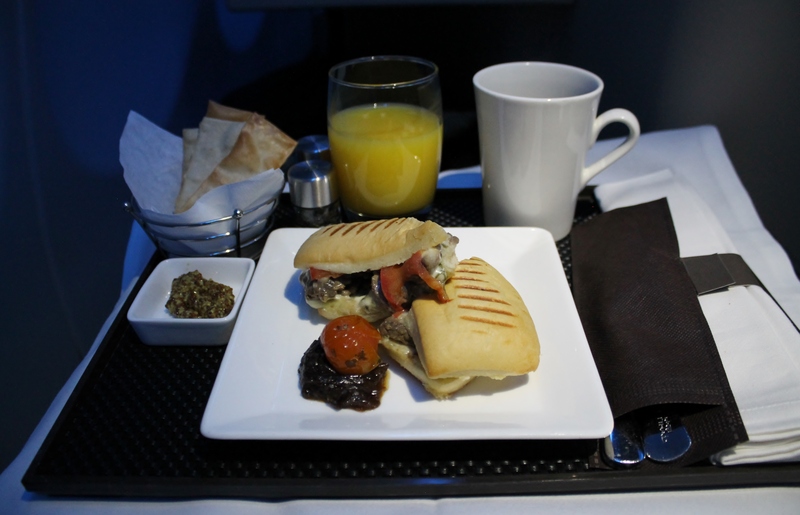 This also operates as a snack menu and a la carte menu with simple hot dishes (or breakfast dishes on a night flight). The main meal time consisted of three choices of starter – an Arabic dessert and an international or western soup. This was followed by the main course which on this flight included five different choices, a mix of Arabic and international dishes and a vegetarian option. Finally, dessert is offered – two different desserts as well as fresh fruit and ice cream. The Kitchen Anytime menu consisted of two hot options – steak sandwich with toppings or alternatively a falafel and a grilled wrap. In addition to this, there were cheeses, fresh fruit, ice cream, chips and cookies as well as Arabic baklava and crispy bread. 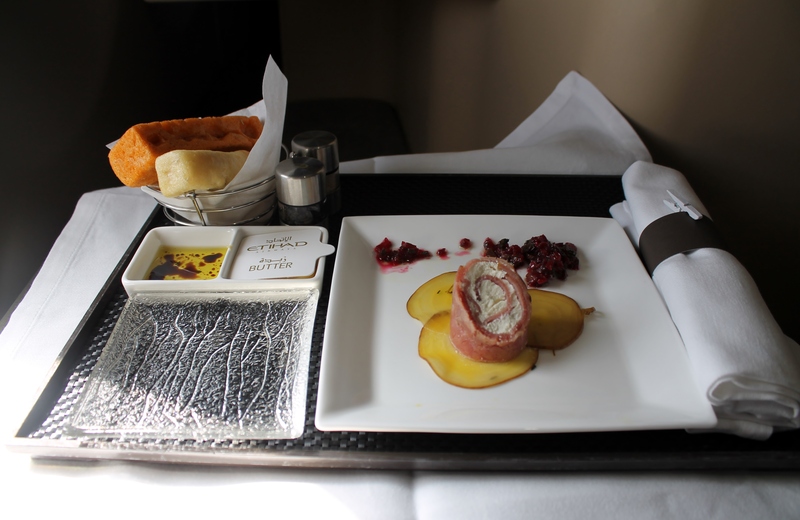 In practice, everything on the menu is available to order when you want during the flight, so consider your main meal later in the flight when ordering from this menu. The drink menu consisted of champagne, three white wines, three red wines, dessert wine, four beers and various apéritifs, spirits and liqueurs. Of course, there were also soft drinks and juices. If you wanted to perk up with a cup of coffee, in addition to regular coffee and decaffeinated options, there was also espresso, macchiato, latte and cappuccino. The tea assortment consisted of eight varieties, all from Dilmah. After take-off, the meal began with a cocktail and nuts. I ordered a glass of red wine and chose the Californian, Murphy-Goode Pinot Noir 2010. It was very nice and also in that the wine was served to my place on a tray. With the correct mannerisms, I also sampled wine while the bottle was held up before it was poured into a large wine glass. At the same time, orders were taken for other food and drink. For some passengers, this was done even before take-off. A white cloth was laid on the table and then the meal tray laid out. Etihad has chosen a method of serving with no carts to be used in the cabin and therefore most of the serving is done individually from the galley and with an à la carte approach. They do, however, still use trays. The tray was nicely decorated with a mini version of the first class decor with a separate bread basket and small bowls of butter and oil. On the tray was also salt and pepper. Of the three starters, I chose a roll consisting of steak, truffle and cream cheese that was served with beetroot and salsa. Nothing whatsoever wrong with the meal but not a favourite for me personally. Maybe it would have been more enjoyable to try the Arabian mezze dish. However, it was nice to have the personal bread basket with a variety of intriguing breads that was late refilled. The plate was taken away and then the main course was served. 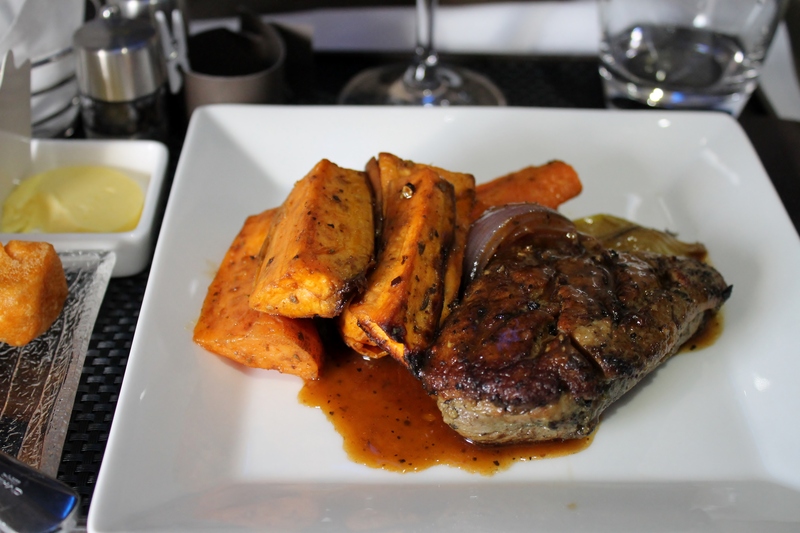 Of the five choices, I ordered the grilled steak which was served with mashed potatoes and roasted vegetables. It tasted superb with the excellently cooked piece of meat. I was also offered a refill of wine. Each cabin crew member who came to my place had my wine variety and consequently a note about what each passenger selected for their beverage must have been written. The tray was removed and then remained the dessert. I decided to skip the cheese and instead concentrated on the banana mousse cake with raspberry compote. This also tasted superb and an extra plus must be given for the presentation. I got one last refill of my glass of wine and also ordered a cup of coffee. After two hours of rest, I later ordered a snack, a gin & tonic and a slice of cake. On board were American chocolate chip cookies and French madeleines. Just over two hours before landing, I decided to have a second meal as most of the other passengers had one ​​between one and two hours before arrival. I ordered a hot steak sandwich that was served with red onion, cheese, mayonnaise and salad. This was really very tasty and it came with its own basket of bread on the tray. Finally, I ordered in some fresh fruit and a cup of coffee. A second meal from Kitchen Anytime may sound better than what it actually is. There is no three-course gourmet meals we talked about, but of course it is always a positive to have an alternative. Etihad has, just like many airlines from the Middle East, a great mix of nationalities, which means some challenges arise when trying to create a consistent service. I think, by and large, Etihad have succeeded in doing so. 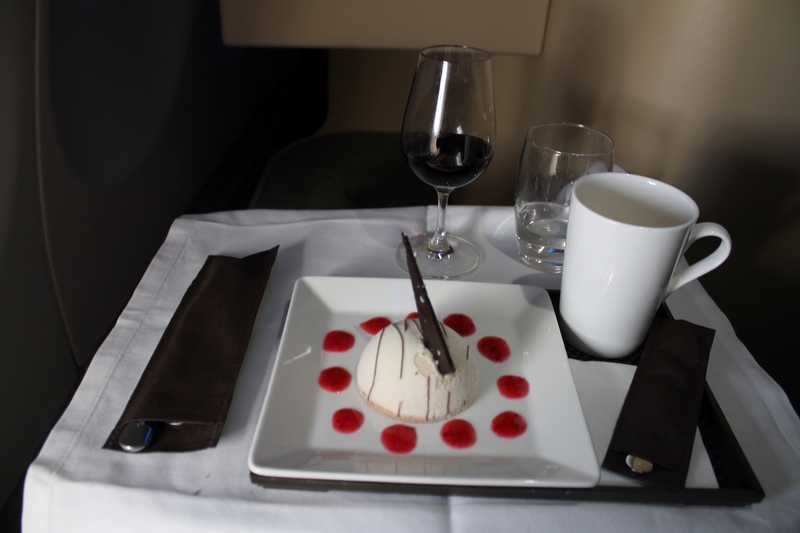 During all my flights during the trip I felt welcome and the service was consistently to a high standard. I pondered quite a bit about the people I talked to from the UK, Thailand, India or any of the Gulf countries. The service itself seemed to me tasteful, attentive, neat, elegant, friendly and polite. It was the kind of premium feel I would like to encounter on board. Otherwise there was not much small talk during the flight, most of the staff kept a certain distance, but the official parts were handled very well. I also liked the service arrangement. In that no carts were used and that the wine was poured out of a big bottle on a tray in front of the seat, and also into a large wine glass. Very sleek handling. There was also nothing missing the service, it seems they have good procedures for handling orders despite all meals being prepared individually in the galley. The times that I pressed the call button, there was usually someone on site half a minute later. After a night flight from Europe to Abu Dhabi with too little sleep, I decided after lunch to fold out my seat and get some rest. The seat was, like I said, completely horizontal when folded out and when I selected the seat location 7A, at the window with the cocktail table between me and the aisle, I was well shielded from other passengers and any activity in the aisle. The seat was comfortable to sleep in, perhaps slightly hard, but otherwise it was fine. With a seat width of 20 inches (51 cm), it is a bit smaller than what you get in first class and it’s not entirely easy to turn during the night. 20 inches, however, is about standard for most airlines when it comes to business class. In addition to getting a seat that is flat and has a sensible inclination (preferably completely horizontal of course), I also highly value privacy and to avoid being disturbed by other passengers or lights in the cabin when i am sleeping. In this sense the seat stands up well. We had a punctual landing in Johannesburg just after the 5pm. Most intercontinental flights to South Africa are night flights and arrive in the morning, when it can be a hefty wait at passport control. At 5pm there was almost no other arrivals at all and entry formalities were completed in two minutes. Even checked baggage arrived quickly including my priority tagged bag that was one of the first on the band. I was out in the arrivals hall less than 20 minutes after we landed. A very good flight. I liked the service concept and especially appreciated the elegant serving. Even Etihad business seats stand up well against the competition. Abu Dhabi Airport is convenient but could otherwise benefit from a expansion as it will probably be crowded during peak hours. 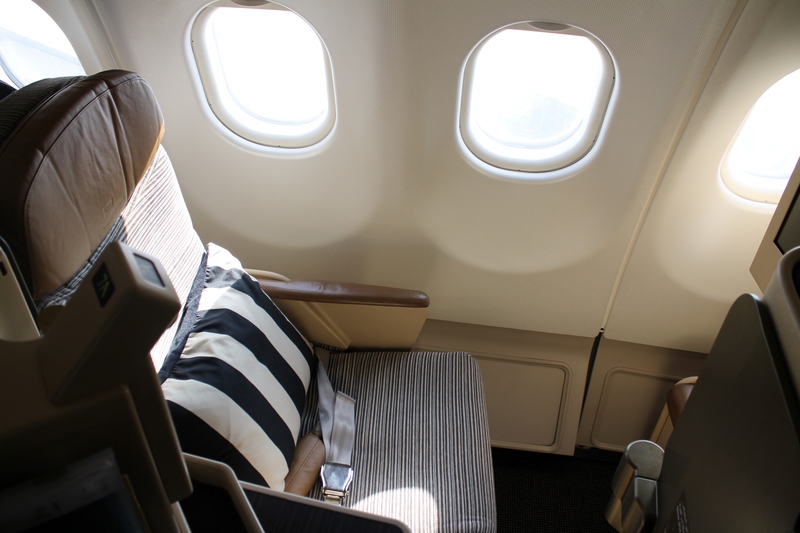 The seats A and K at the window are best if you are traveling alone. If you are travelling with a companion, the middle section is preferable, E and F and D or G, depending on how close you want to sit. Intog inte mat under resan (sen avgång, tidig ankomst, valde att sova), men menyen såg lovande ut. Gäller A330-200 i Jet Airways konfiguration, med business class i 1+1+1 layout. Gäller A330-200 dry-leased hos Jet Airways, med 1+1+1 konfiguration i J class. Slutbetyget hämnar på en 6:a eftersom vi bussades till planet i JNB, och bussades från planet efter ankomst in AUH. Även om det fanns en separat buss för J class pax vid ankomst, så sköttes det hela överlag mycket illa, och gick mycket långsamt. Boarding med buss i AUH fungerade mycket dåligt. Hade jag inte varit uppmärksam hade jag hamnat på en buss som hade tagit mig till flyget till Bryssel, i stället för Amsterdam. Bussen för J class har redan kört innan de flesta J class pax hade lyckats kämpa sig förbi kön till Priority Boarding disken. Lång sightseeing tur runt hela flygplatsen i en fullproppad buss, avgången försenades 90 minuter. 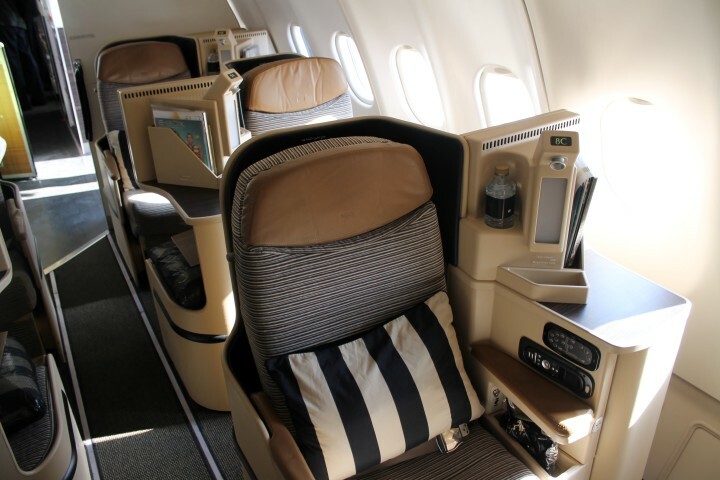 Back to "Etihad Business Class Airbus A330/A340"